Popular torrent site BT-Chat.com has decided to throw in the towel after receiving a hand delivered letter from the MPAA. The Hollywood studios argue that the torrent index is in violation of U.S. law, and accuse its operators of contributory copyright infringement. Over several years the Canada-based torrent index BT-Chat has grown to become one of the most popular among TV and movie fans. The site was founded over a decade ago and has been running without any significant problems since. Starting a few days ago, however, the site’s fortunes turned. Without prior warning or an official explanation the site went offline. Instead of listing the latest torrents, an ominous message appeared with a broken TV signal in the background. 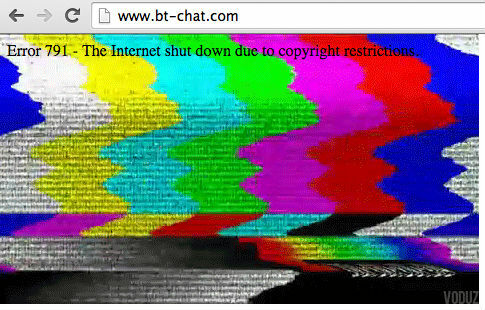 “Error 791-the internet is shutdown due to copyright restrictions,” the mysterious message read. Initially is was unclear whether the message hinted at hosting problems or if something more serious was going on. Many of the site’s users hoped for the former but a BT-Chat insider informs TF that the site isn’t coming back anytime soon. 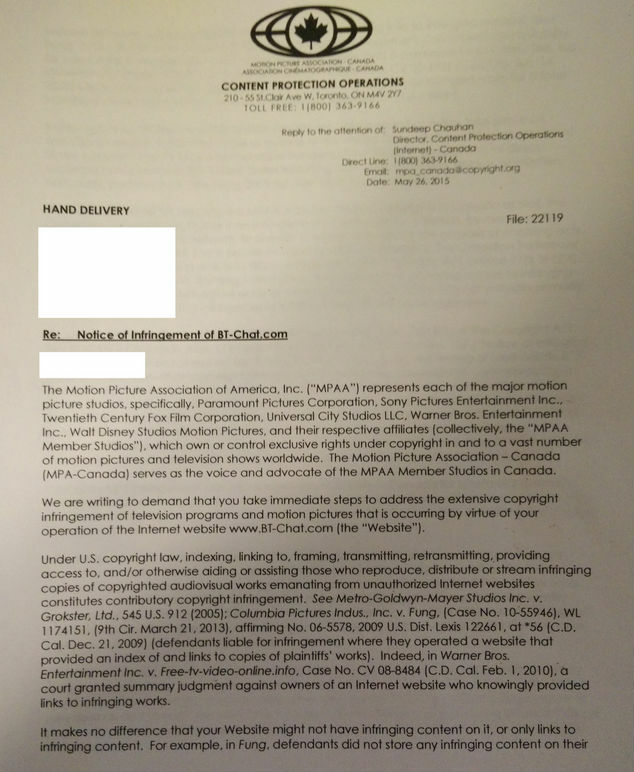 The site’s operators have decided to pull the plug after receiving a hand delivered letter from the Canadian MPA, which acts on behalf of its American parent organization the MPAA. In the letter, shown below, Hollywood’s major movie studios demand that the site removes all infringing torrents. The MPAA makes its case by citing U.S. copyright law, and states that linking to unauthorized movies and TV-shows constitutes contributory copyright infringement. Referencing the isoHunt case the movie studios explicitly note that it’s irrelevant whether or not a website actually hosts infringing material. “It makes no difference that your website might not have infringing content on it, or only links to infringing content,” the letter says. The threats from Hollywood have not been taken lightheartedly by the BT-Chat team. While giving up a site that they worked on for more than a decade is not easy, the alternative is even less appealing. In the end thry decided that it would be for the best to shut the site down, instead of facing potential legal action. c There are 50 comments. Add yours?